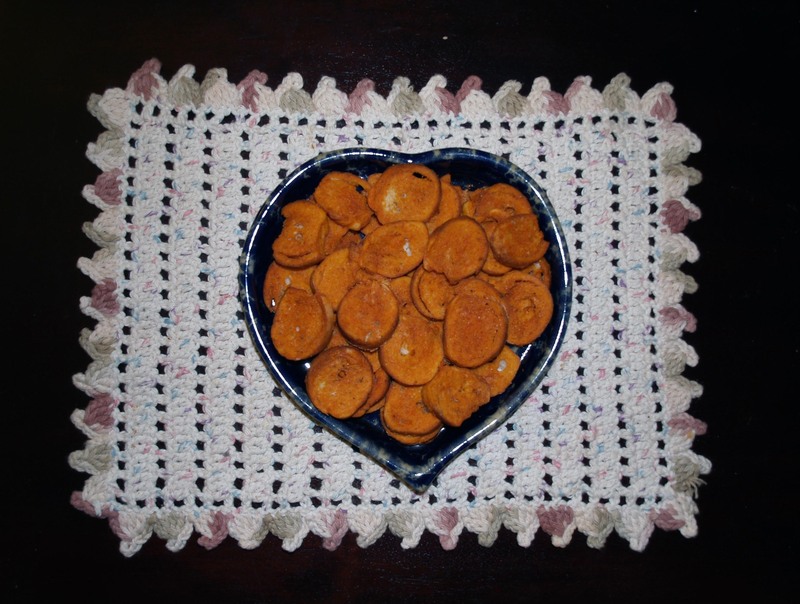 Buffalo Bagel Chips | I Wanna Bake! Sorry for the delay today! Life got in the way a bit this week, so I hadn’t had the usual time to devote to writing. Fear not, though. Today I bring you Buffalo Bagel Chips! (Or at least the directions to make your own, I wasn’t planning on hand-delivering bagel chips to all my readers, though you are all lovely.) This week’s post was originally supposed to be about cinnamon pie, but that was a 2-day disaster, so bagel chips it is. Buffalo sauce (and spicy food in general) really isn’t my thing, but Josh loves it so much that he eats it on his sandwich everyday for lunch. Since I like him so much, I decided to make a snack just for him. If you, like me, don’t like Buffalo sauce, you could try this with watered down barbecue sauce or balsamic dressing. I intend to try those myself sometime, so I’ll update this post as necessary when I do. I’m still not sure if the ranch dressing powder added any significant flavor to the chips, but Josh claims that they seemed less spicy than those I made without it, so if you want to tone down the heat a little, I’d recommend adding it. You could also try dipping them in regular liquid ranch dressing, just like real Buffalo wings. They’d also go well with a classic spinach dip, spreadable cheese, Chex party mix, etc. The possibilities are endless. If you come up with a new use for these, share it in the comments! This bakeventure took less active cooking time than it would have to go through my cd collection (yes, cd collection) to pick something to listen to, so I just turned on the radio. Let the djs agonize over the music choices this time so you’re free to get stuff done while you’re waiting for spicy, crunchy deliciousness. Preheat your oven to 250°F. Line your cookie sheets with aluminum foil. 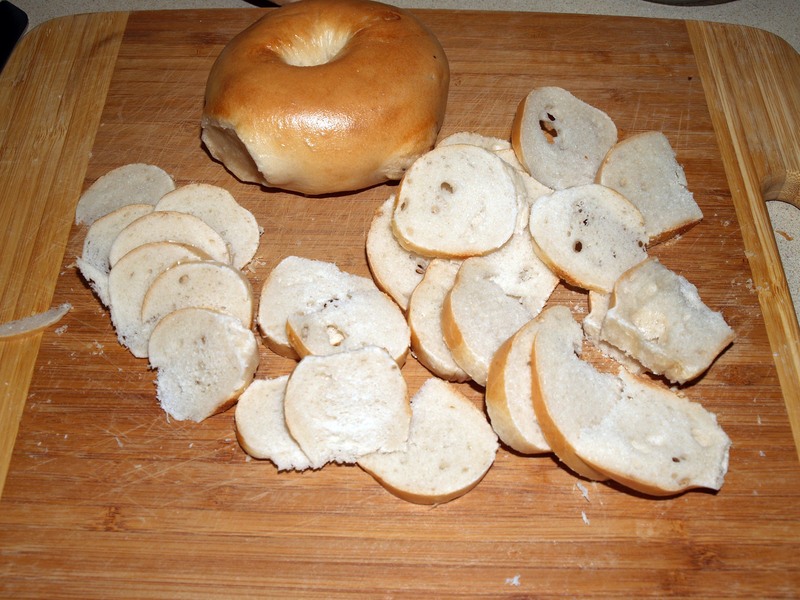 Slice the bagels into ⅛” thick discs. Admittedly, mine turned out a bit more wedge-shaped than disc-shaped, so do your best to keep them uniform, but don’t go too crazy. 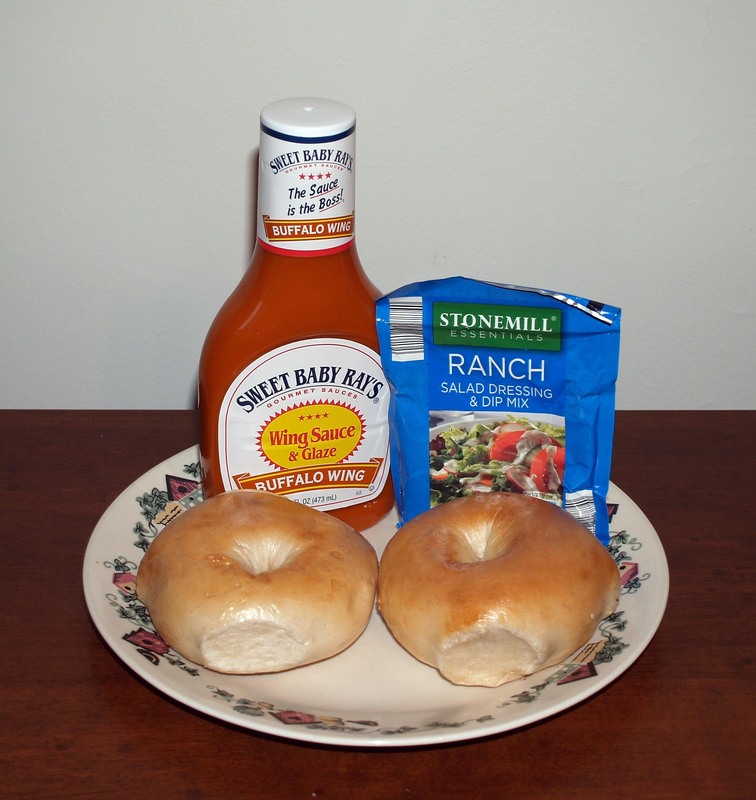 For the next step, you have two options: you can either (a) pour the wing sauce into a bowl and dip the bagel discs in the sauce individually or (b) put the bagel discs into a resealable plastic bag, pour the wing sauce in, and shake it up until the bagel pieces are fully coated. I tried both ways and ended up liking option (b) better, but to each his own. 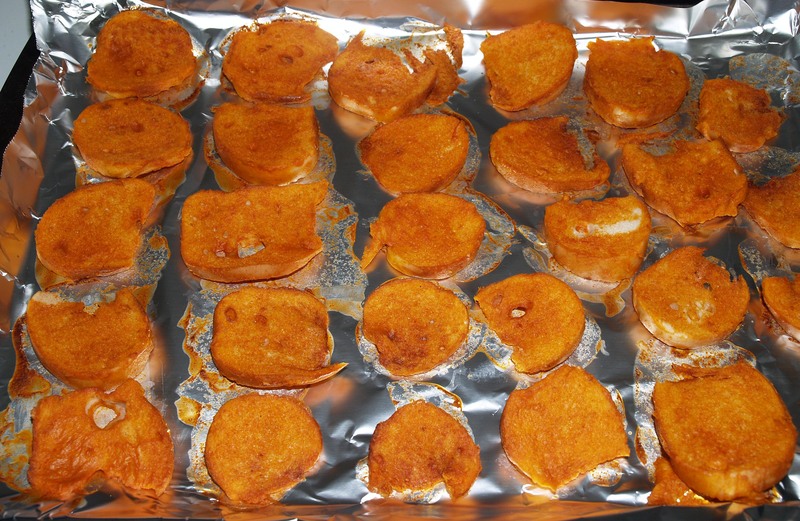 Arrange the bagel chips on your cookie sheets without overlapping. Sprinkle the ranch dressing powder over them if you choose to use it. Bake the chips for 20 minutes, then carefully flip them with tongs or a spatula. They will be pretty fragile at this point, so be careful not to tear them. 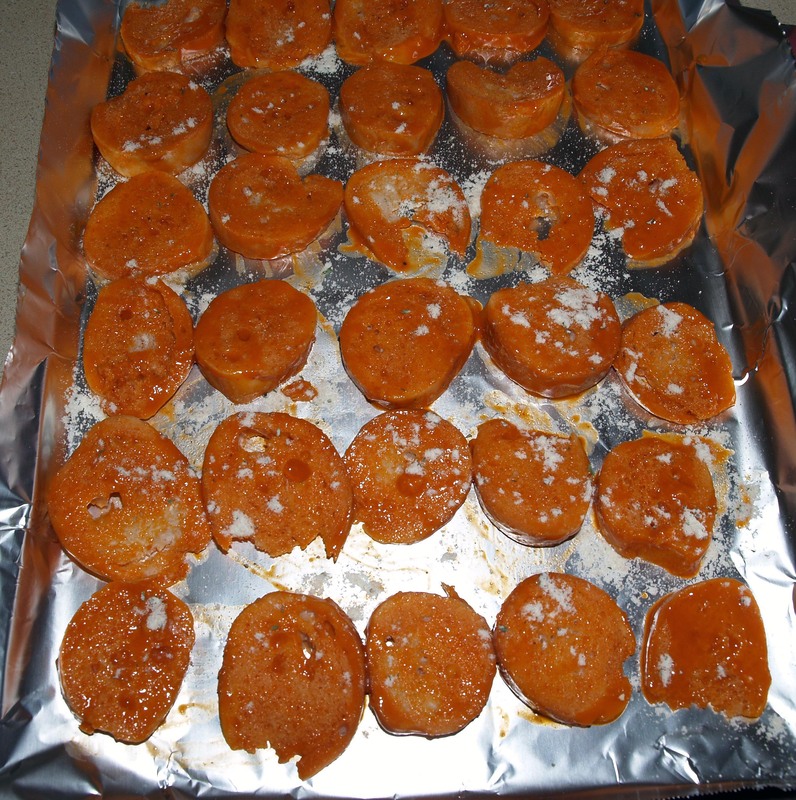 Bake them for another 20-25 minutes, until they look dry and are starting to harden. Leave them to cool on the cookie sheets for 15 minutes, or until they are cool enough to handle, then peel them off and serve or store in an airtight container. If you’re feeling fancy, you can even try using them in your holiday Chex party mix (you’d better believe you’ll be seeing a post on that soon).